We have to assume that our information is at risk, and take steps to protect our data. To help you with this, we’ve outlined a few steps below. Many people save their passwords to online services and sites on their device, but don’t seem to consider what could happen if someone accessed their phone. For your security, do not store important passwords on your device. If you are running on Kit Kat or Lolipop, there are both screen lock and encryption functions for increased security. There are several types of screen locks such as password, pin, pattern and face unlock, and you can find them in your Android settings. Try to use patterns of PINs that are difficult for other people to guess, but that you’ll easily remember. Please lock your apps, especially the ones containing private information that you don’t want anyone to see. Try a free app like App Lock. And to add more security, don’t use a combination of a pin or pattern lock that can be traceable from the smudges of your screen – yes, people can trace this. Before installing an app from Google Play, a list of requested permissions will pop up to show you what permission the app requires. 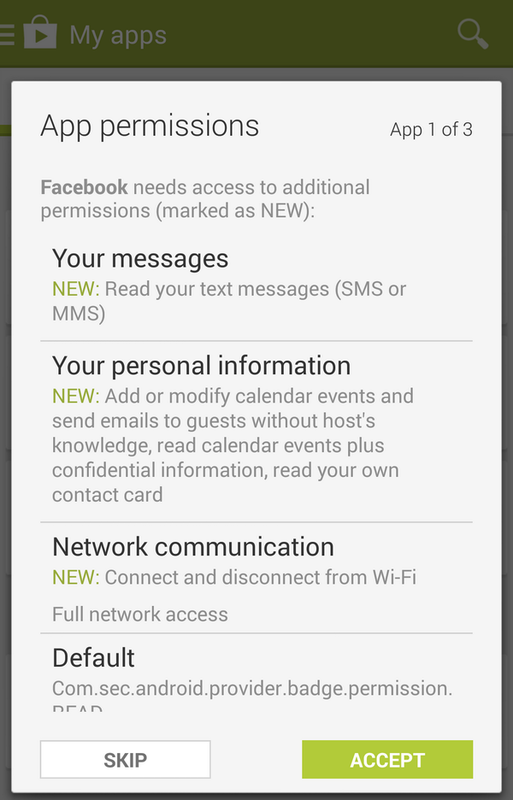 Apps require permissions to do things but not all of them are necessary. Always read through the permissions to make sure they make sense and correspond to what the app actually does. For example, an alarm app does not require access your text messages. Not all apps in the Play Store are safe, so beware. Don’t use public WiFi when you want to do something that transmits sensitive data, such as online banking. They can easily sniff out your packets and translate it into actual data of your private information, i.e., your passwords. You can protect your information by using apps like Hideninja VPN so that your outgoing connection is always encrypted, making it harder for anyone to sabotage your data. If you suspect that your device is being attacked, WiFi Protector can help fend off these attackers. It will make your life easier to have an app that handles most of your security. Find a mobile security app that you are comfortable using like Lookout Security & Antivirus or avast! Mobile Security. It is imperative in this day and age that you back up your important data. If your device is lost, stolen, damaged or hacked, and you haven’t backed up the data, you may still be forced to do a remote wipe to prevent the person from accessing your information. But this will mean that you will lose all your information in your device. So you have a backup already but you really want to get your lost device back. There are plenty device-tracking apps for Android can help you locate your lost or stolen device, and some can even remotely activate your phone’s GPS. So you are at the point where you have everything installed and ready to go. But, you still need one last feature – the ability for you to wipe your device remotely. This is necessary, especially when you are sure that you cannot retrieve your Android device. Make sure you have a pattern or password lock for your mobile device. Use a mobile security app on your phone. Flee from public wifi. If you must use one, do not perform financial transactions.